Pro tip: You must be on the Ultra plan or higher to enjoy all the below features. How to ugrade ? 1. 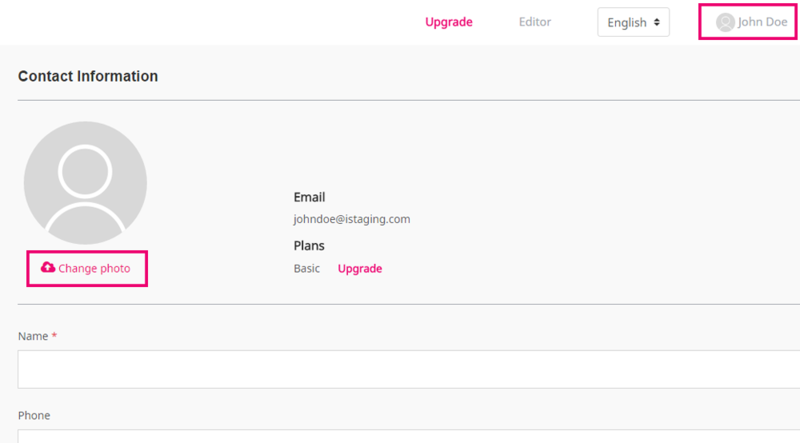 To replace the iStaging logo with your own logo or photo in the top-left corner of the LiveTour, log in to your dashboard, click on your Profile and upload an image. It will be the same across all your LiveTours. 2. Log in to the VR Editor. To add your logo at the bottom of the LiveTour, open a LiveTour and upload your logo from Basic information tab. You can also choose how large you'd like it to be. It can be different for every LiveTour. Don't forget to click Update LiveTour once you're done. 3. You can also decide to show or not show your contact information at the top of your LiveTours, let users leave comments on them, as well as remove the "Powered by iStaging" mention.